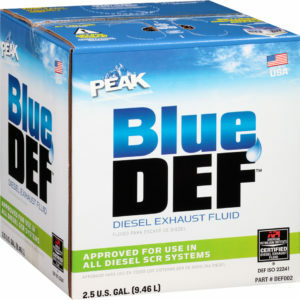 Yoder Oil is proud to carry the Peak BlueDEF brand of diesel Exhaust Fluid. We carry BlueDEF in Gallons, 2.5 Gallon containers, 55 gallon drums and bulk. 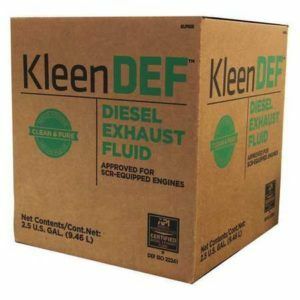 Located in Elkhart, Indiana we will deliver diesel exhaust fluid in the surrounding area and we will ship anywhere within the United States. The market for DEF is being created due to the new emission requirements by the EPA to meet the most recent Clean Air Act specifications. SCR uses diesel exhaust fluid and a SCR catalytic converter to significantly reduce nitrogen oxide emissions in diesel engines. Also, it is a nontoxic solution of 67.5 % purified water and 32.5 % ultra pure automotive grade urea. DEF usage will be approximately 2% of the diesel fuel consumption. Peak BlueDEF meets the ISO 22241 quality standard and is an American Petroleum Institute certified diesel exhaust fluid.